This article is about different types of steak. For beef steaks, see beefsteak. For fish steaks, see Fish steak. For other uses, see Steak (disambiguation). Steak is usually grilled, but can be pan-fried. It is often grilled in an attempt to replicate the flavor of steak cooked over the glowing coals of an open fire. 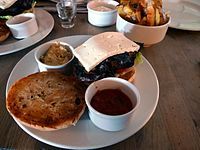 Steak can also be cooked in sauce, such as in steak and kidney pie, or minced and formed into patties, such as hamburgers. Steaks are often cut from grazing animals, usually farmed, other than cattle, including bison, camel, goat, horse, kangaroo, sheep, ostrich, pigs, reindeer, turkey, deer, and zebu, as well as various types of fish, especially salmon and large pelagic fish such as swordfish, shark, and marlin. For some meats, such as pork, lamb and mutton, chevon, and veal, these cuts are often referred to as chops. 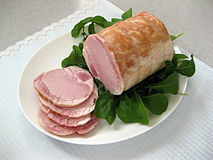 Some cured meat, such as gammon, is commonly served as steak. Grilled portobello mushroom may be called mushroom steak, and similarly for other vegetarian dishes. Imitation steak is a food product that is formed into a steak shape from various pieces of meat. Grilled fruits such as watermelon have been used as vegetarian steak alternatives. The word steak originates from the mid-15th century Scandinavian word steik, or stickna' in the Middle English dialect, along with the Old Norse word steikja. The Oxford English Dictionary's first reference is to "a thick slice of meat cut for roasting or grilling or frying, sometimes used in a pie or pudding; especially a piece cut from the hind-quarters of the animal." Subsequent parts of the entry, however, refer to "steak fish", which referred to "cod of a size suitable for cutting into steaks", and also "steak-raid", which was a custom among Scottish Highlanders of giving some cattle being driven through a gentleman's land to the owner. An early written usage of the word "stekys" comes from a 15th-century cookbook, and makes reference to both beef or venison steaks. Livestock for meat to be used as steak cuts may be raised on a farm or ranch. The meat from various wild game may also be used for steak cuts. Countries with enough suitable land for grazing animals, in particular cattle, have a history of production and culinary use of steak. Such countries include Argentina, Ireland, New Zealand, Australia, South Africa, the United States, and the United Kingdom. In Asian countries, such as China and South Korea, steak is traditionally sliced and stir-fried and served in smaller amounts as part of a mixed dish. In Argentina, beef represents a large portion of the country's export market. A total of 11.8 million animals was harvested in 2010. The country has one of the largest consumptions of beef per capita worldwide, and much of it is grilled steak. Beef steak consumption is described as part of the "Argentine national identity". In 2010, 244,000 cattle producers were in Argentina. In Argentina, steakhouses are referred to as parrillas, which are common throughout the country. Portion sizes of steak dishes in Argentine restaurants tend to be large, with steaks weighing over 454 grams (1 lb) being commonplace. Asado is a traditional dish that often includes steak and is also the standard word for "grilled" in Argentina and other countries. Asado is considered a national dish of the country. Domestic and international marketing of Australian beef is undertaken by Meat & Livestock Australia, a corporation which runs programs related to quality assurance, sustainable production, and environmental considerations, through organizations such as Meat Standards Australia. The Irish agricultural beef market is a contributor to the economy of Ireland. A significant amount of Irish beef is exported to other countries, with over 50% going to the United Kingdom. The "Steak of Origin" competition has been run for a decade on behalf of the Beef+Lamb Corporation of New Zealand. It "aims to find the most tender and tasty sirloin steak" in the country. Criteria for judging claims to include tenderness, pH, marbling and percentage cooking loss", but while these data are collected for each entrant steak, only the shear force (correlated to perceived tenderness) determines qualification to a tasting panel, at which objective taste from a panel determines the winner. The pH is used solely to disqualify entrants and neither the 'marbling' or the cooking loss have any effect on the outcome of the competition at any stage. Their parallel competition, which they run for lamb legs (glammies) does take into account some of these other metrics when weighting the entrants for their ranking within the competition. 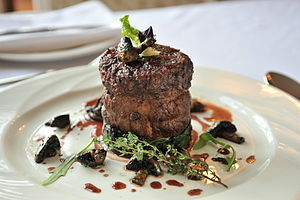 According to a survey by trade magazine Caterer and Hotelkeeper, the most popular dinner menu in British restaurants in the 1980s included steak: prawn cocktail, steak and Black Forest gateau. Cattle breeds such as Hereford or Aberdeen Angus date back to the 1700s, and farmers continue to raise cattle sired by registered pedigree bulls. Bullocks, which live outdoors year-round, grow slowly as they would in their natural habitat, ultimately producing a distinctly tender meat. Around 2,200,000 cattle are slaughtered for beef each year in the United Kingdom. 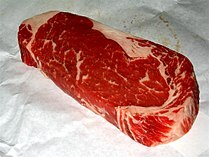 In the United States, cuts of beef for retail sale include various beefsteaks, as well as stew meat and hamburger meat. In the U.S. circa 1956, about 24% of retail beef cuts were steaks. Beef production is the largest single agricultural venture in the United States, with 687,540 farms raising cattle and over a million in the production process, as of the 2007 Agriculture Census. On average, a single farm typically raises about 50 cattle at a time, with 97% of the cattle farms classified as one of these small family farms. These smaller farms average a gross cash income of $62,286 per year as of 2007. Beef steaks are commonly grilled or occasionally fried. Grilled beef steaks can be cooked at different temperatures, or for different lengths of time; the resulting cooked steak ranges from blue (very rare) to overdone. The most common characteristics of a rare steak is a soft, cold, red center. The outside is seared for flavor, while the inside is cooked to suit the diner's preference. Steaks cooked well done are usually cooked throughout the entire cut of meat. For example, a beefsteak cooked well done will not have any pinkness in the middle when sliced. Uncooked beef steak can be served raw, such as in steak tartare. Fish steaks are generally cooked for a short time, as the flesh cooks quickly, especially when grilled. Fish steaks, such as tuna, can also be cooked to various temperatures, such as rare and medium rare. The different cuts of steak are - rib eye, sirloin, tenderloin, rump, porterhouse, and t-bone. Cuts of steak are quite dissimilar between countries owing to different methods of cutting up the carcass. The result is that a steak found in one country is not the same as in another, although the recipes may be the same, differing "only in their sauces, butters, or garnitures". Most important is trying to achieve Maillard reaction on meat to ensure that restaurant-quality steak results each time. Romsteck or rumsteck: rump steak cut from the part of the rump which faces the large end of the filet. This cut needs to be best quality, well-aged. Châteaubriand: corresponds to the undercut or filet portion of a porterhouse steak. Down on the place d'Armes near Racouchot's, there was a restaurant ...the Pré Aux Clercs ... [that] made very good grilled rare steaks with watercress, which at that time were beginning to be in great vogue in the big cities among the younger generation ...les sportifs... but were dismissed with impatient disgust by older gourmands raised in the intricate traditions of fine sauces and culinary disguise. It was like the Chateaubriant at the other end of the town, also known mostly for its steak and watercress and french fries. M. F. K. Fisher, writing about dining in Dijon in 1929. Steak has become a popular dish in many places around the world, cooked in domestic and professional kitchens, and is often a primary ingredient in a menu. It is used in small amounts in an hors d'oeuvre, in an entrée dish or, more usually, in a larger amount as the main course. Steak has also been an important breakfast dish, especially for people undertaking hard outdoor work, such as farmers. Diners ordering steak at a restaurant typically advise the chef or waiter of their preferences regarding the degree of cooking, using the terms "rare", "medium rare", "medium", "medium well", or "well done". Print appearances of this use of "rare" are found as early as around 1615. A steak knife is a specialized piece of cutlery to make cutting the steak easier; it is sharper than other knives and may have a serrated edge. Badge of the Sublime Society of Beef Steaks: a grill and the motto "Beef and Liberty"
Beefsteak Clubs were once part of London's club life. They were described as "a club of ancient institution in every theatre; when the principal performers dined one day in the week together (generally Saturday), and authors and other geniuses were admitted members." Dr Johnson's club in Ivy lane was originally a Beef-Steak Club and the "Rump-Steak or Liberty Club" was in existence from 1733–34. The present-day Beefsteak Club, established in 1876, is at 9 Irving Street, London. Among its members are many notable people. A steakhouse is a restaurant that specializes in beefsteaks and other individual portions of meat. Chophouses started in London in the 1690s, and served individual portions of meat, known as chops. The houses were normally only open for men; for example, women were only admitted to Stone's Chop House in 1921. Accounts of travellers in 19th-century London refer to their "dining off mutton chop, rump steak and a 'weal' cutlet", as well as hams and sirloins. Delmonico's restaurant in New York City, which opened in 1827 and stayed open for almost 100 years, has been described as "the most famous steak restaurant in American history". Delmonico steak refers to a method of preparation from one of several cuts of beef (typically the rib cut) prepared Delmonico style, originally from the mid-19th century. Hundreds of restaurants continue to specialize in serving steak, describing themselves as "steakhouses", competing for culinary awards and aiming for culinary excellence. Commercially produced bottled sauces for steak and pre-mixed spices are also popular. In 2012 in the U.S., A1 Steak Sauce had slightly over 50% of the market share for all meat sauce products, and was the category leader. Montreal steak seasoning is a spice mix used to flavor steak and grilled meats that was based on the pickling dry-rub mix used in preparing Montreal smoked meat. Steak and other meat products can be frozen and exported, but before the invention of commercial refrigeration, transporting meat over long distances was impossible. Communities had to rely on what was locally available, which determined the forms and tradition of meat consumption. Hunter-gathering peoples cut steaks from local indigenous animals. For example, Sami cuisine relies partly on the meat of the reindeer; the Inuit diet uses locally caught sea-mammal meat from whales; Indigenous Australians ate kangaroo; and indigenous North American food included bison steak. In the Middle East, meat recipes from medieval times onwards simply state "meat" without specifying the kind or cut; "apart from an occasional gazelle, kid or camel", only lamb and mutton were eaten because cattle were seldom bred. In contemporary Argentina, where steak consumption is very high, steak is a significant part of the national cuisine and the asado has the status of a national dish. In Austria, the national dish is Wiener Schnitzel, which is a type of steak made from veal. Advice on butchery and recipes for American black bear steak and chops is provided by New Jersey (US) government. Many types of beefsteak exist. The more tender cuts of beef, from the loin and rib, are cooked quickly, using dry heat, and served whole. Less tender cuts from the chuck or round are cooked with moist heat or are mechanically tenderized (e.g. cube steak). Beef steak can be cooked to a level of very rare (bleu, a cold raw center), rare, medium rare, medium, medium well, or well done. Pittsburgh rare is charred on the outside. Beef, unlike some other meats, does not need to be cooked through. Food-borne human illnesses are not normally found within a beef steak, though surfaces can potentially be contaminated from handling, thus very rare steak (seared on the outside and raw within) is generally accepted as safe. Beef steak is graded for quality, with higher prices for higher quality. Generally, the higher the quality, the more tender the beef, the less time is needed for cooking, or the better the flavor. 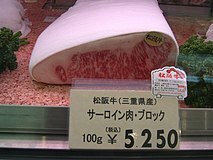 For example, beef tenderloin is the most tender and wagyu, such as Kobe beef from Japan, is known for its high quality and commands a high price. Steak can be cooked relatively quickly compared to other cuts of meat, particularly when cooked at very high temperatures, such as by broiling or grilling. The quality and safety of steak as a food product is regulated by law. Australia hase National Meat Accreditation standards; Canada has the Canadian Beef Grading Agency; in the United Kingdom, the Food Standards Agency is responsible; in the United States, young beef is graded by the United States Department of Agriculture as Select, Choice or Prime, where "Prime" refers to beef of the highest quality, typically that which has significant marbling. In 1996 in the U.S., only 2.4% of cattle were graded as prime, and most Prime beef is sold in restaurants and hotels. Chicken fried steak – a breaded cutlet dish consisting of a piece of steak (tenderized cube steak) coated with seasoned flour and pan-fried. It is associated with U.S. Southern cuisine. Hamburg steak – a beefsteak shaped into a patty to be cooked after being minced. It is similar to the Salisbury steak. Made popular worldwide by the migrating Germans, it became a mainstream dish around the start of the 19th century. Restructured steak – a class of beef steaks made from smaller pieces of beef fused together by a binding agent. Its development started in the 1970s. Salisbury steak, first recorded in 1897 and named after James Salisbury, a doctor during the American Civil War, who recommended people eat hamburger three times per day. During World War I, American soldiers replaced the word "hamburger" with Salisbury steak for political reasons. Fish steaks are cut perpendicular to the spine and include bones. Although their delicate flesh requires quicker cooking than beef, steaks from swordfish, halibut, tuna, salmon, and mahi-mahi can be grilled. They are frequently cooked whole or as fillets. Fish steaks may also be poached or baked using a court bouillon, wine or sauce or cooked en papillote. Commercial sashimi tuna steaks may have their coloration fixated by the use of flushing with carbon monoxide (CO), whereby CO is pumped into bags containing the tuna, which is then stored at 4°C. The duration of time for color fixation to occur varies per the size of the meat. For example, a 2-inch tuna steak takes 24 hours for color fixation to be completed using this process. When used, color fixation using CO occurs prior to the vacuum sealing of tuna steaks for storage. In Japan, color fixation using CO is prohibited. Pork steaks are generally cut from the shoulder of the pig, but can also be cut from the loin or leg of the pig. Shoulder steaks are cut from the same primal cut of meat most commonly used for pulled pork, and can be quite tough without long cooking times due to the high amount of collagen in the meat; therefore, pork shoulder steaks are often cooked slower than a typical beef steak, and may be stewed or simmered in barbecue sauce during cooking. Cooked gammon steaks are a component of a full breakfast, whereas steaks from a rolled pork loin are more likely to be served at lunch. Thick sliced or chopped and formed chicken is used to create mainly traditional southern dishes such as chicken fried chicken. This may also refer to beef cuts such as a hip steak or a shoulder blade steak, or a small portion of chuck steak with a visible line of white connective tissue. Sliced vegetables can be used as vegetarian nonmeat "steak" alternatives, such as cauliflower, portobello mushrooms, and eggplant. Beans and legumes (such as soybeans) have also been used to form steak-like foods. Watermelon steaks are sliced and cooked pieces of watermelon. ^ a b Carrier, Robert (1 January 1981). Robert Carrier's Kitchen. 1. London, UK: Marshall Cavendish. p. 1456. ^ "Exotic Meats USA - Kangaroo". Retrieved on 23 December 2014. ^ "Eating Skippy: Why Australia has a problem with kangaroo meat". BBC News. Retrieved on 23 December 2014. ^ Kitchen, The Canadian Living Test. "Mushroom Steaks". Canadian Living. ^ "steak (n.)". Merriam-Webster. Merriam-Webster, Inc. 2014. Retrieved 2 October 2014. ^ "The Compact Edition". Oxford English Dictionary. 2. England,UK: Oxford University Press. 1933. p. 883. ISBN 9780198611172. 10104594. Retrieved 14 October 2014. ^ Ayto, John (1990). The Diner's Dictionary: Word Origins of Food and Drink. Oxford University Press. pp. 351–2. ISBN 978-0-19-964024-9. ^ "Chinese peasants had already mastered the richly varied environment and knew every edible part of it, which helped them to withstand famine. The stir-fry technique conserved precious firewood and enabled cooks to be exceedingly adaptable." Symons, Michael (2007). One Continuous Picnic: A gastronomic history of Australia (2nd ed.). Carlton, Victoria: Melbourne University Press. pp. 86–87. ISBN 9780522853230. ^ a b Arelovich, Hugo M; Bravo, Rodrigo D; Martínez, Marcela F (October 2011). "Development, Characteristics & Trends for Beef Cattle Production in Argentina". 1 (2). Animal Frontiers: 37–45. Retrieved 9 October 2014. ^ Romero, Simon (13 June 2013). "Argentina Falls From Its Throne as King of Beef". New York Times. Retrieved 13 October 2014. ^ "Argentina Livestock and Products Annual 2011" (PDF). Foreign Agricultural Service. United States Department of Agriculture. Retrieved 12 October 2014. ^ Moss, Chris; McGarvey, Declan (2010). DK Eyewitness Travel Guide: Argentina. Penguin. p. 288. ISBN 0756686571. ^ Yogerst, Joe; Mellin, Maribeth (2001). Argentina. Globe Pequot. p. 39. ISBN 0762703547. ^ "El asado" [The asado]. Vía Restó.com (in Spanish). Buenos Aires: Grupo Clarín. 28 April 2010. Retrieved 29 December 2012. Nacido en el centro de las costumbres gauchas, el asado se impuso como el plato nacional por excelencia. ^ "Marketing beef & lamb - Meat & Livestock Australia". www.mla.com.au. ^ Sarzeaud, Patrick; Dimitriadou, Andie; Zjalic, Milan (2008). EU Beef Farming Systems and CAP Regulations. Wageningen Academic. p. 69. ISBN 9086860583. ^ Wood, Roy C. (17 February 2010). Strategic Questions in Food and Beverage Management. Routledge. p. 69. ISBN 978-1-136-36209-5. Retrieved 8 October 2014. ^ "Waitrose beef". Retrieved 8 October 2014. ^ "Beef farming in the UK". Living Countryside. Archived from the original on 11 February 2015. Retrieved 8 October 2014. ^ a b Baef marketing margins and costs, Volumes 708–721. U.S. Dept. of Agriculture, Agricultural Marketing Services. 1956. pp. 12–13. ^ "Cattle Industry: Who We Are" (PDF). Cattlemen's Beef Board and National Cattlemen's Beef Association. 2009. Retrieved 8 October 2014. ^ "Beef Production". United States Environmental Protection Agency. 12 April 2013. Retrieved 8 October 2014. ^ Peterson, James (2014). A Cook's Guide to Knowing When Food Is Perfectly Cooked. Chronicle Books. p. 107. ISBN 1452132283. ^ Bodnant, Carly. "Steak Cooking Times". bodnant-welshfood. Retrieved 8 November 2015. ^ a b Beck, Simone; Bertholle, Louisette; Child, Julia (1961). Mastering the Art of French Cooking. Middlesex, England: Penguin Books. pp. 315–317. ^ Pappas, Stephanie; April 15, Senior Writer |; ET, 2014 04:03pm. "How to Cook the Perfect Steak (with Science)". Live Science. Retrieved 2018-12-17. ^ M.F.K. Fisher (1993). Long Ago in France. London: Flamingo. p. 39. ISBN 058609248X. ^ O'Conner, Elizabeth (1958). Steak for breakfast. Sydney, NSW: Angus & Robertson. ^ "["implied in: G. Markham Eng. Hus-wife in Countrey Contentments ii. 54 To know when meate is rosted enough, for as too much rareness is vnwholsome, so too much drinesse is not nourishing. [at rareness n.2] 1776 G. Colman Spleen ii. 26 For which reason they leave the food without any juices at all. Without them, Sir, instead of beef or mutton, you might as well eat mahogany?. Eat your meat as rare as possible, Sir..." Olver, Lynne (18 August 2014). "The Food Timeline". Retrieved 8 October 2014. ^ a b Timbs, John (1866). Club Life of London with Anecdotes of the Clubs, Coffee-Houses and Taverns of the Metropolis During the 17th, 18th, and 19th Centuries:. London: Richard Bentley, New Burlington Street. p. 159. ^ Burnett, John (2004). England Eats Out: A Social History of Eating Out in England from 1830 to the Present. Pearson/Longman. p. 101. ISBN 0-582-47266-0. ^ Virginia, Curle (1963). A History of Stone's Chop House. London, England. ^ Peter Ackroyd (2003). London the biography (1st Anchor Books ed.). New York: Anchor books. p. 310. ISBN 0-385-49771-7. ^ Schatzker, Mark (2010). Steak: One Man's Search for the World's Tastiest Piece of Beef. New York: Penguin Group. ISBN 1101190108. ^ Joe O' Connell. "Delmonico steak: a mystery solved". Retrieved 17 March 2007. ^ Tramonto, R.; Goodbody, M.; Fink, B. (2010). Steak with Friends: At Home, with Rick Tramonto. Andrews McMeel Publishing. p. 244. ISBN 978-0-7407-9257-1. ^ Pettit, Raymond (2012). Learning From Winners. Psychology Press. p. 74. ISBN 1136676767. ^ Roden, Claudia (1970). A Book of Middle Eastern Cooking. Middlesex, England, New York, New York, Ringwood, Victoria, Australia, Ontario, Canada, Auckland New Zealand: Penguin Books. p. 212. ^ "Graziers Australian Beef". Graziers Australian Beef. ^ "Facts and Origins Wagyu Meat - Black Gold Farms". www.blackgoldfarms.com.au. ^ "AusMeat Ltd National Accreditation Standards". ^ "Meat premises and slaughter". Food Standards Agency. ^ a b c Meadows, Larry (28 January 2013). "What's Your Beef – Prime, Choice or Select?". USDA. Retrieved 6 October 2014. ^ "Quality beef demand outstrips supply" (PDF). Western Livestock Journal. 13 March 2006. Retrieved 6 October 2014. ^ "What is the origin of Salisbury steak? How about hamburger?". Dictionary.com. Random House,Inc. 2014. Archived from the original on 6 October 2014. Retrieved 2 October 2014. ^ Peterson, James (2003). Essentials of Cooking. Artisan Books. pp. 112–113. ISBN 1579652360. ^ Psilakis, Michael; Binns, Brigit; Shapiro, Ellen (2009). How to Roast a Lamb. New Greek Classic Cooking (1st eBook ed.). New York, NY: Little, Brown and Co./Hachette Book Group. ISBN 9780316071734. Retrieved 12 October 2014. ^ "Bobby's Chicken-Fried Chicken". foodnetwork.com. Retrieved October 18, 2018. ^ Pépin, Jacques (2012). Jacques Pépin New Complete Techniques. Black Dog & Leventhal Publishers. p. 23. ISBN 978-1-4532-9508-3. ^ Sinclair, Charles Gordon (1998). International Dictionary of Food and Cooking. Taylor & Francis. p. 118. ISBN 978-1-57958-057-5. ^ Yonan, Joe. "Weeknight Vegetarian: Craving a vegetable 'steak'". Washington Post. Retrieved 9 October 2014. ^ "Bean "steak" manufactured for factory menus". New Scientist. Reed Business Information. 56 (814): 21. 5 October 1972. ISSN 0262-4079. Retrieved 15 October 2014. ^ Institute of Food Science and Technology (U.K.), Ireland. Irish Livestock and Meat Commission (1971). Beef processing and marketing: proceedings of an International Symposium held in Dublin, April 28–29, 1971. An Foras Talúntais. p. 22. Retrieved 8 October 2014. ^ Minutes of the Wartime Conference of General Managers. W.E. Long Company. 1943. p. 19. Retrieved 8 October 2014. Fussell, Betty Harper (2008). Raising Steaks: The Life and Times of American Beef. Houghton Mifflin Harcourt. ISBN 0151012024.